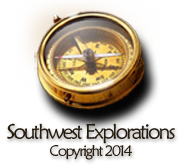 This website is dedicated to the study, identification, and mapping of several of the early routes used by United States exploring expeditions in the mid-nineteenth century. The research published here employs a study of original documents and diaries, maps, illustrations, and field research. Modern technologies such as Google Earth, rephotography, and digital mapping are all used in this work. CUSTOM CARTOGRAPHY: Color and black & white maps created for publication in history books, display posters, & presentations. TRAIL ANALYSIS: Careful studies of the trails followed by various government exploring expeditions across New Mexico, Arizona, and California in the mid-1800s. REPHOTOGRAPHY: The explorer’s reports and personal diaries contained pictures of many locations along the way. These images are used to help find trail locations and campsites by finding the artist’s vantage point and replicating the scene in a modern photograph. ARTICLES: This section contains published and unpublished articles and papers describing research findings on historic campsites, routes, and trail landmarks. Please come in and browse in the sections that interest you!